Queen by right, the kingmaker's daughter. Daughter of smoke and bone, runaway. Thanks, Katja! 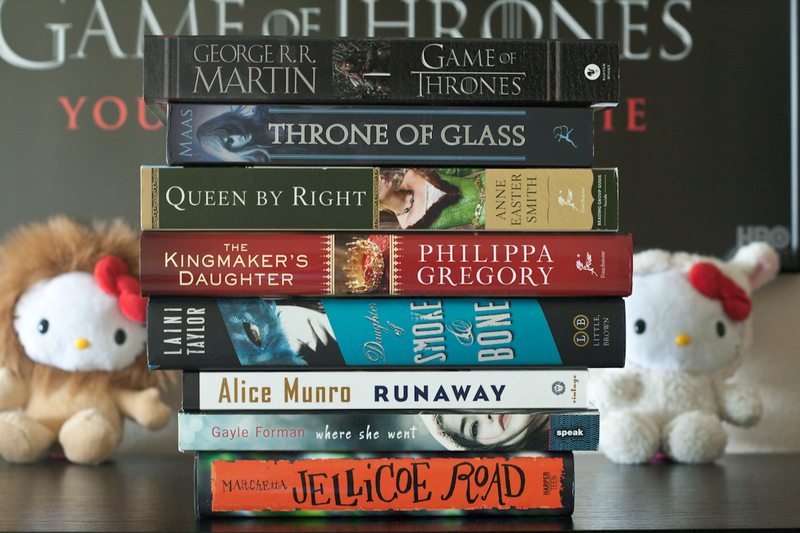 The royal theme just happened- I'm usually very bad at these book spine poems, lol. I freaking love this! The theme of hegemony and royalty is outstanding, especially since I love Game of Thrones, and had no idea how to incorporate in a book spine poem. It's all thanks to Throne of Glass! If I hadn't been reading it earlier this week, I never would have thought of using Game of Thrones in the poem. Okay, this one is GREAT! I love it (+ the cute hello kittys behind it!)! The Hello Kittys insisted on being in the photo, lol. Thanks for stopping by! Lovely book spine poem ♥ both regal and mysterious :) Nicely done! Yours is so far the best one I've seen! Thank you! I didn't realize I had several royal-themed titles until I started grabbing them off the shelves, lol. Oh I really like it! I'm glad that you decided to join in, I think you did a fantastic job :D Jaclyn @ JC's Book Haven. That's the biggest book spine poetry challenge for me- finding titles that somewhat make sense together!